A lot of pre-workout formulas today promise to deliver long-lasting muscle pumps, but instead just end up creating a disappointing one. If you really want insane muscle pumps and incredible muscle vascularity every time you hit the weight room, better start using Nutrex N-Vein! Nutrex N-Vein is designed to be added onto your favorite pre- or intra-workout shake, ensuring that your muscles are kept well-supplied and hydrated with nutrients all day – leading to vein-popping muscle pumps that last for many hours at a time. This pump-inducing supplement does not contain any stimulants that can cause crashes or buzzes. How does Nutrex N-Vein work? Cluster dextrin, which improves the delivery of nutrients to your muscle cells. Hydromax, a blend of glycerol and silica that will drive more fluid into your muscles. Nitratene, which is designed to increase nitric oxide levels in the body, leading to the relaxation and widening of your blood vessels that will allow a stronger flow of blood, oxygen, and nutrients to reach your muscle cells. Potassium bicarbonate and Di-magnesium malate, to replenish depleted electrolytes and protect your body from getting dehydrated. 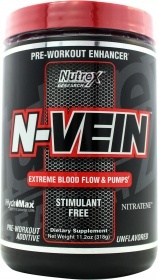 How do you use Nutrex N-Vein? Just add 1 scoop of Nutrex N-Vein to your pre-workout shake plus an additional 120 to 180ml of water. Shake rigorously and consume half an hour before exercise – and just get yourself ready for mind-blowing muscle pumps! Get those massive muscle pumps every time you start your exercise... load up with Nutrex N-Vein! Have a question about N-Vein? What is it, what does it do, how and when to use or something else? Ask us. N-Vein 30 servings is a discontinued product. Please browse other products you might be interested in.. Shake container prior to each use to redistribute ingredients. For the ultimate in pump and performance add 1 scoop into your pre-workout drink of choice along with an additional 120-180ml of water. Stir or shake vigorously. Consume 30 minutes prior to training. WARNINGS N-Vein : Do not exceed one (1) serving (1 scoop) at a time, in a 24 hour period. Keep out of reach of children. These statements have not been evaluated by the Food and Drug Administration. This product is not intended to diagnose, treat, cure, or prevent any disease.